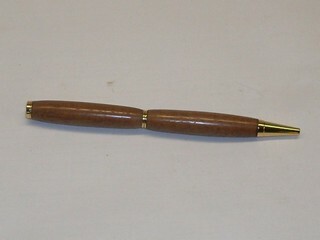 Made from the slimline kit, this pen has rounded body blanks for a heavier pen. Ipe. Again from the slimline kit but using a larger body diameter. I often call this the executive pen from a time I was in a suit store and was told they now call their executive style suit what was once their "short and portly". 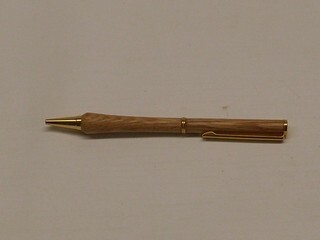 This pen is turned from acrylic in what I now call a European style since the Cross Company objected to pen turners using their Mont Blanc™ name on this style of pen. 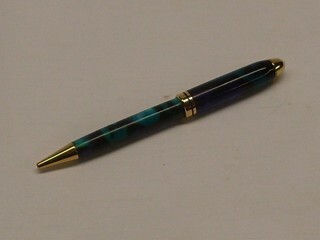 They have trade marked the pen style and make a lovely pen so who can blame them? Whatever it is called, this is a great feeling pen. 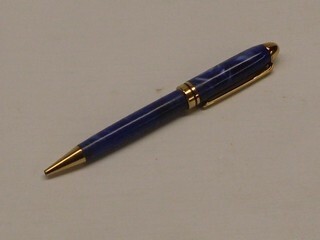 Another of the European in Royal and Navy blues. These are interesting to turn and the acrylic adds a new dimension. I prefer to turn wood but other materials add their own challenges. 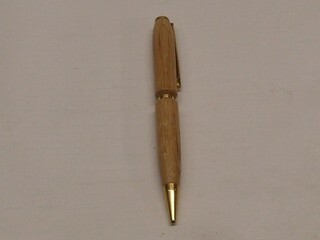 This is a slimline with a flared tip turned of red oak. A slimline turned of pearl acrylic with swirls of black. 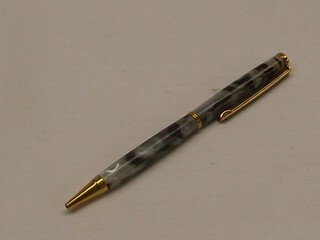 When turning a pen like this the brass tubes need to be painted white to give the proper look to the pearl.